On Friday 22nd March the Parent Teachers Group at St. Andrews International School organized their first Sponsored Walk-a-Thon on the School Field. 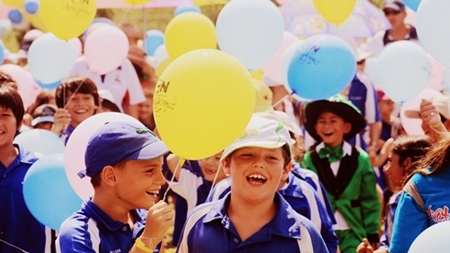 The aim of the event was to create a chance for the whole School Community to have fun with everyone’s friends and family, to get fit and help make this a great day for the whole school. 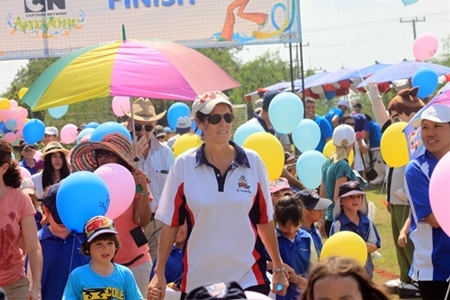 This was accomplished with over 300 children participating, many with Parents and many in fancy dress, walking between 4 to 12 laps of a 500 metre walking circuit. During the afternoon many attractions were arranged for the children including a bouncing castle, face painting, and the school’s Football Academy giving demonstrations to which the children of all ages were invited to join. Refreshments were provided by the school’s sport’s committee and we were fortunate to have our own special MC – Chris Parsons – on hand during the afternoon. Best fancy costume (left) and friends. * Assist funding a proposed Habitat for Humanity Thailand rebuilding project that the students and parents will get involved with in June this year. * Purchasing Resuscitation Annie Doll. 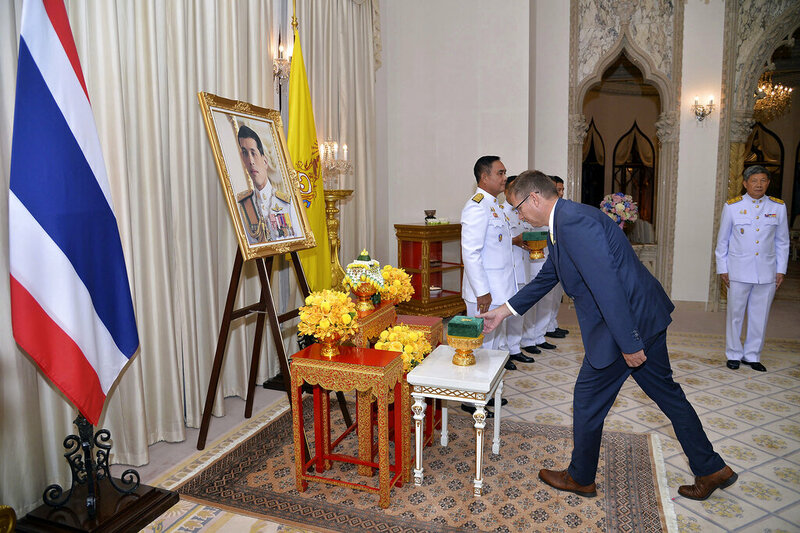 * Assist funding a new sala for the school’s hard court area. Family: You will never walk alone. 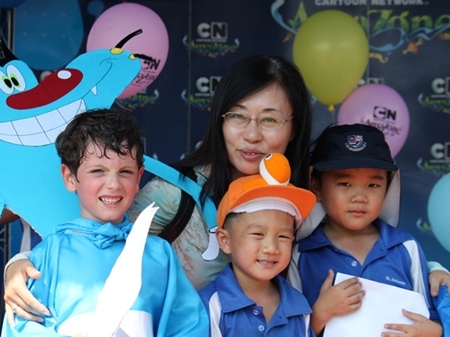 The event would not have been such a success or an attraction without the positive support received from Cartoon Network Amazone who not only provided the prizes but also provided goodie bags and a balloon for all walkers and special gift bags to the winners. Mrs. Jennifer Doig, Chief Marketing Officer of CN kindly presented the prizes. 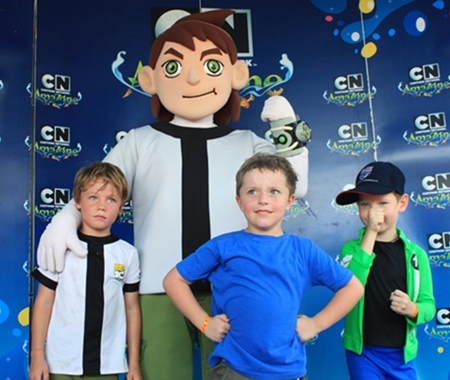 A special visit to the school from the Ben 10 mascot was also arranged. He not only started the walk but also was available for photographs with the children during the afternoon. Cartoon Network Amazone also provided a static display of the world’s first Cartoon Network themed waterpark which is set to make a huge splash in Bang Saray in late 2013. Head of School and our teachers. Success for an event such as this is not down to one or two people – it was a team effort. Many parents and older students during the afternoon were involved with both registering the walkers and monitoring the number of circuits completed. Mr. Andy Harrison, the headmaster and the teachers were all actively involved in the planning and organization of the event before the day and also supporting the event on the day in many helpful ways. But last and not least we all have to thank the children who happily took part and raised this substantial amount of money. The whole school community is now talking about this, our successful event, and we can go forward to planning our next event on 26 April which will be a sparkling “Grand Opening” of the school’s new canteen. Pure Joy from the field. Hero of the day: Ben 10!